I have recently been digging the work of Italian jazz pianist/composer Roberto Magris, and my listening life is all the richer for it. 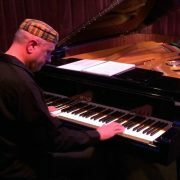 Whether you love full-blooded, in-the-swinging-tradition piano; or exploratory, forward-searching compositions; or rhythmic, funky fun, Magris’ music is a rich discovery. Born in Italy in 1959, Magris can play lyrical, swinging, bebop jazz with alto great Herb Geller (An Evening with Herb Geller & The Roberto Magris Trio, JMood Records). He can compose and play modern, impossibly catchy, funky jazz (Enigmatix, JMood Records). Or Magris can compose and play futuristic-yet-grounded-in-roots music (as he does on the two cd masterwork, Aliens In A Bebop Planet, JMood Records, which deals with how bebop might sound to an alien landing on Earth). Since the late ’70s, Magris has recorded 26 albums with his own groups, playing in 41 different countries in Europe, America, Asia, Africa and Australia. On the magical album, An Evening With Herb Geller & The Roberto Magris Trio, he is joined by Nikola Matosic on bass and Enzo Carpentieri on drums. To the ears of this Geller fan, the late alto giant’s playing is among his very finest captured on disc. On the infectious Enigmatix-which could fill the dance floor of any hip urban nightclub-Magris is accompanied by Dominique Sanders on bass; Brian Steever on drums; Palo Sanhueza on congas and percussions; and the gorgeous voice of Monique Danielle. Also highly recommended is Morgan Rewind: A Tribute to Lee Morgan Volumes I & II. What does the future hold for Roberto Magris?